Known as 'Taiwan's Kyoto', Tainan is rich in heritage and charm. Fuqian Road was built in the Japanese colonial period when the concept of western urban planning was introduced in Tainan. After that time, Taiwan's economy took off and Fuqian Road became prosperous until now. Homecoming wanderer chose this place as the base, and expected to display local feature and serve with local food. “Line” is the main conceptual design from beginning. The restaurant occupies two of five joined two-story street houses. Well- preserved carving wall and close lightly pebble surface express the original feature. Vertical long windows increase extra retro-style. Tiles which are piled on the back wall of entrance presents beautiful pattern. The old house are installed the new soul. 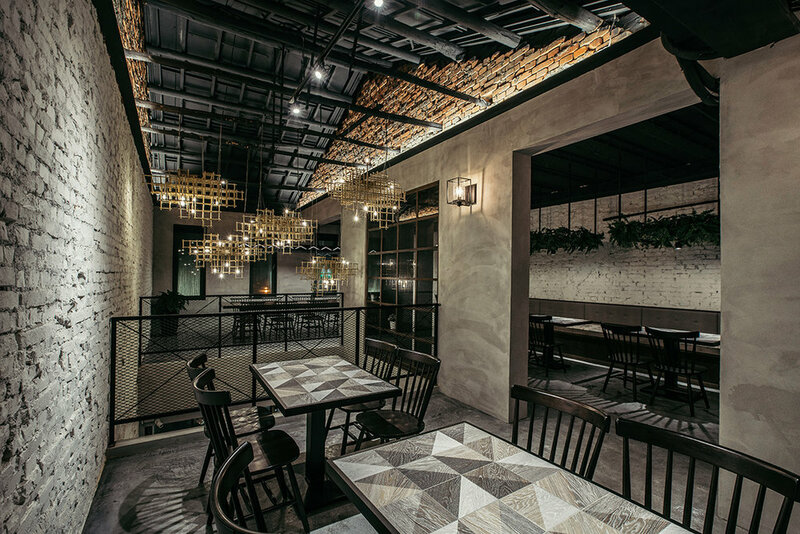 Dining area on the ground floor is decorated by wood grain tiles for distinguishing from working area. Semi open kitchen provides a clear view of cuisine preparing process to increase more safety and trust of customers. The crockery and cutlery are placed in the storage cabinet of dining area which is embedded in the wall and covered by black square tiles. Dining tables decorated with triangle geometry tiles are attractive and practical. The original spaces of these two buildings are different. Internal space is opened up by taking down the partition wall on second and third floor. One building retains the top triangular steel frame from original structure and form open dining area with high ceiling. It exactly meets LOFT style which is very popular now. The light stand consists of extended steel frame from the roof. 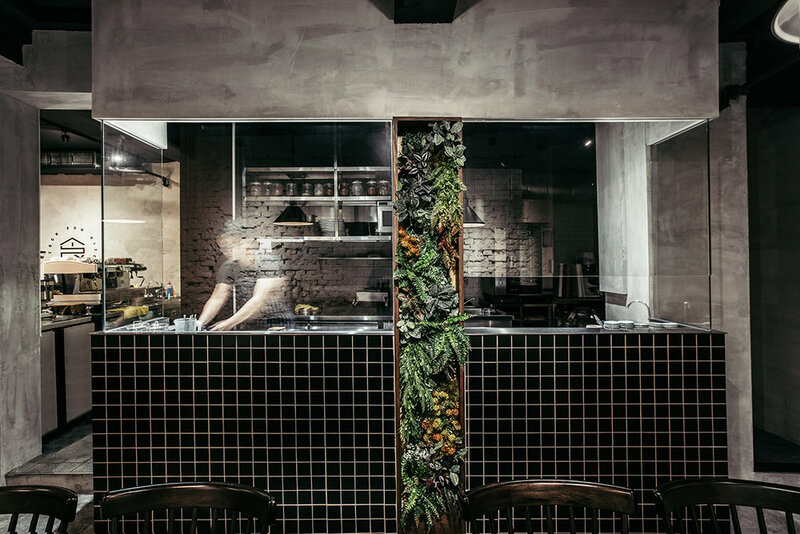 Large mirror are surrounded by green plants and reflect the meal from dining table. It is interesting for diners to see one meal in front of them on dining table and another meal on their top in the mirror. The floor near window side is covered with exotic tiles and cleverly separates the space. Another building keeps original wooden truss of the roof. It exposes red brick wall from beginning and below part of red brick wall is painted with white color. 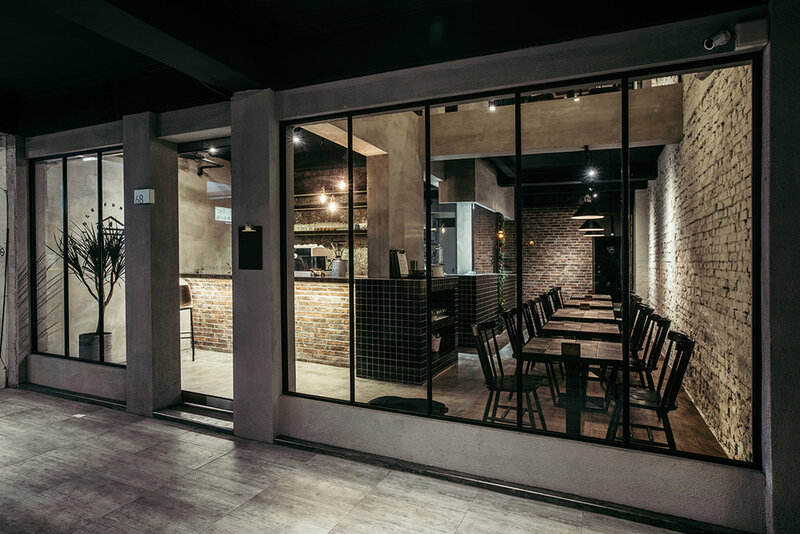 The void on the second floor not only provides the first floor with tall ceilings, but also enlarges visual space and provides a patio for the restaurant. 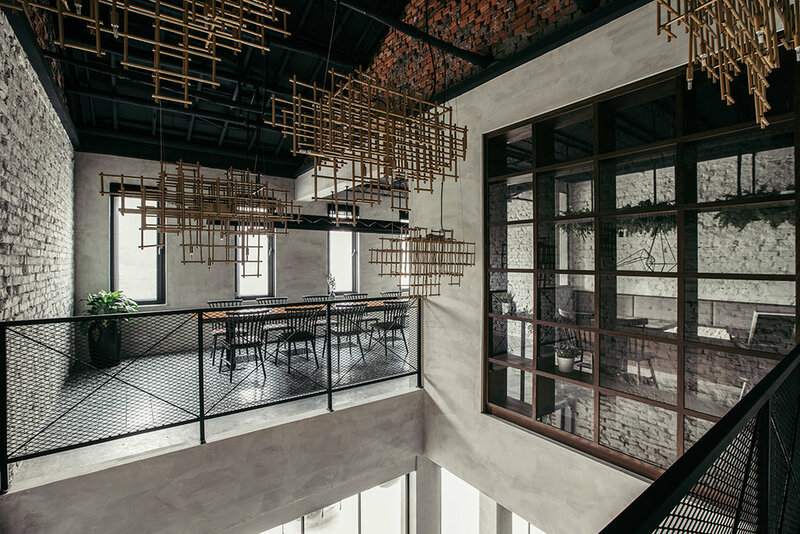 The customized gold bronze chandeliers with vector pattern are hung from the roof. It shows the junction of tradition and modern, and symbolizes the fusion of old and new. Creative cooking method with local food and new look with original house are all in “In Stock Fun Kitchen”. In Stock Fun Kitchen. Eat For Fun.